Sterling (concussion) didn't practice Wednesday, Brian Costello of the New York Post reports. Analysis: Sterling's absence confirms he's likely still in the initial stages of the NFL's five-step concussion protocol after he exited Sunday's loss to the Bears with the head injury. Considering Sterling previously missed time earlier in the season with a concussion, it's looking unlikely that he'll be available for this weekend's game against the Dolphins. Sterling sustained a concussion in Sunday's loss to the Bears, Rich Cimini of ESPN.com reports. Analysis: Sterling exited in the first half and did not return after entering the concussion protocol. The 30-year-old missed multiple games after suffering a concussion earlier this season and a similar absence this time around wouldn't be surprising. Sterling (head) won't return to Sunday's game versus the Lions. Analysis: It appears to be Sterling's second concussion of the season, which could lead to a lengthy absence. If that's the case, Jordan Leggett will work as the No. 2 tight end behind Chris Herndon. Sterling was forced out of Sunday's game versus the Jets and is being evaluated for a head injury, Manish Mehta of the New York Daily News reports. Analysis: Sterling missed two games due to a concussion earlier this season. He suffered a hard hit to his head from Bears' corner Kyle Fuller and immediately headed to the locker room. If he can't get cleared, expect Jordan Leggett to shift to No. 2 while Chris Herndon continues to get starter's reps.
Sterling failed to come down with either of his two targets in a 37-17 loss to the Vikings on Sunday. Analysis: Sterling has been surpassed by rookie Chris Herndon at the tight end position. Herndon caught four passes for 42 yards while scoring a touchdown for the second week in a row. While Sterling's a converted wide receiver who can help out with the team battling injuries at that position, the chances of him doing so against the Bears in Week 8 or beyond look slim. 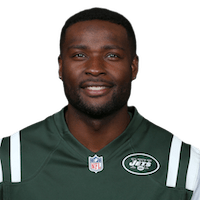 Sterling is expected to see increased involvement in the Jets' game plan Sunday against the Vikings with Quincy Enunwa (ankle) ruled out and Terrelle Pryor (groin) listed as doubtful, Rich Cimini of ESPN.com reports. Sterling caught both of his targets for 13 yards in Sunday's 42-34 win over Indianapolis. Sterling (concussion) won't carry an injury designation into Sunday's game against Indianapolis. Analysis: Sterling suffered the concussion Week 2 against the Dolphins but finally appears ready for a return to game action. It has yet to be announced the 30-year-old has officially cleared the concussion protocol, but his lack of an injury designation speaks to his progress heading into Week 6. Sterling (concussion) was a limited participant at Wednesday's practice, Darryl Slater of NJ.com reports. Analysis: Sterling sustained the concussion against the Dolphins in Week 2 and has yet to return to game action. The 30-year-old remains in the concussion protocol despite his limited practice participation and will look to increase his involvement over the next few days ahead of Sunday's game against the Colts. Sterling (concussion) has been ruled out for Sunday's game against the Broncos, Darryl Slater of NJ.com reports. 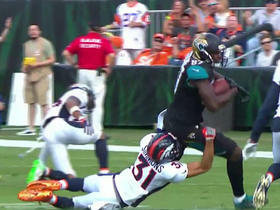 Sterling (concussion) returned to practice Wednesday sporting a red no-contact jersey, Rich Cimini of ESPN.com reports. Analysis: Sterling has missed both of the Jets' last two games after suffering a concussion in Week 2 against the Dolphins, but his presence on the field Wednesday amounts to a significant step forward. His level of involvement in the Jets' final practice of the week Friday should provide a better indication of where his status stands for the Week 5 game against the Broncos. Sterling (concussion) is ruled out for Sunday's game against the Jaguars, Rich Cimini of ESPN.com reports. Analysis: Sterling was unable to participate in practice this week due to a concussion suffered during the Jets' Week 2 loss to the Dolphins, so his lack of availability is no surprise. As long as the veteran tight end remains sidelined, Eric Tomlinson and rookie Chris Herndon will split Gang Green's tight end snaps. Sterling (concussion) was a non-participant in Thursday's practice, Andy Vasquez of The Bergen Record reports. Analysis: Sterling continues to nurse a concussion suffered during the Jets' Week 2 loss to the Dolphins. The veteran has yet to clear the concussion protocol, and he's questionable to suit up for Sunday's game against the Jaguars. If Sterling remains sidelined, Eric Tomlinson and Chris Herndon will be in line for increased snaps. Sterling (concussion) won't play in Thursday's game against the Browns, Rich Cimini of ESPN.com reports. Analysis: Sterling suffered a concussion during Sunday's loss to Miami and has yet to clear the league's concussion protocol. Eric Tomlinson and rookie Chris Herndon are both expected to see an increase in snaps in replace of Sterling. Sterling (concussion) is not expected to play in Thursday's game against the Browns, Brian Costello of The New York Post reports. Analysis: Sterling did not practice Monday and it appears the tight end is going to remain in concussion protocol for the rest of the short week. In Sterling's likely absence, look for Eric Tomlinson and Chris Herndon to split time as the primary tight end for rookie quarterback Sam Darnold and the Jets' offense. Sterling (concussion) did not practice Monday, Andy Vasquez of The Bergen Record reports. Analysis: Sterling's veteran presence was severely missed as the Jets fell to the Dolphins on Sunday. With a short week on the horizon, it seems unlikely Sterling will be ready before the Jets take on the Browns this Thursday. If the course stays the same, it appears Eric Tomlinson and rookie Chris Herndon will split time at tight end. Sterling (head) will not return to Sunday's game against Miami. Analysis: Sterling left Sunday's game with a head injury. Given the nature of concussions in today's game, it's unsurprising the team will have Sterling undergo further tests before returning. Sterling will have to clear the league's concussion protocol before returning. His status for Thursday's game at Cleveland remains in jeopardy. Sterling left Sunday's contest with a head injury, Andy Vasquez of The Bergen Record reports. Analysis: Given the nature of head injuries, it's tough to predict when Sterling will be able to return to action. He will have to clear the league's concussion protocol before he can take to the field again. In the meantime, rookie Chris Herndon and veteran Eric Tomlinson figure to split the snaps left during Sterling's absence. Sterling caught all three of his targets for 27 yards in Monday's 48-17 Week 1 win over the Lions. Analysis: Sterling was easily New York's most productive tight end, with the other three on the roster combining for seven yards on one target. He saw the field on 40 of the team's 60 offensive snaps, with Chris Herndon (34 snaps), Eric Tomlinson (29) and Jordan Leggett (15) all involved to some degree as well. Sterling's strong preseason play appears to have catapulted him to the top of the depth chart, but the Jets' passing game likely won't rely heavily on the tight end position most weeks. Sterling earned a spot on New York's 53-man roster after Saturday's final round of cuts. Analysis: Sterling had a fantastic preseason, getting a grade of 91.5 from Pro Football Focus to lead all of New York's offensive players. With no clear frontrunner for playing time at tight end, Sterling could earn himself a sizable role if he's able to carry his preseason success over to the regular season. Sterling was targeted twice in Friday's 22-16 preseason loss to the Giants, coming away with one catch for 13 yards. Analysis: Sterling has thrown his hat in the ring for the starting tight end position in New York, though the 2015 seventh-rounder's 18 career catches up to this point don't inspire much confidence. He played eight snaps on offense and 15 more on special teams in this one. Sterling has been deemed doubtful to return to Friday's preseason opener against the Falcons due to an ankle injury. Analysis: Sterling was impressive prior to suffering the injury, as he hauled in four catches on five targets for 38 yards. The severity of the issue is unknown at this time, but given that he's competing for a depth role, a relatively quick return would be in his best interest. Sterling inked his restricted free-agent tender with the Jets on Monday, Ethan Greenberg of the team's official site reports. Analysis: Sterling will have to put on a strong showing if he hopes to hang around past the preseason. Despite the somewhat long odds to survive final roster cuts, the Jets' relative inexperience and depth at tight end bodes well for Sterling's chances.